I have been performing many Laser treatments for nail fungus. There have been many questions about the pricing and procedures leading up to the laser treatment so I will take this opportunity to outline them here. When people come in for a laser nail fungus procedure, the first step is to determine if they are a candidate for the procedure. We will evaluate you when you come in for a consultation. If we feel that your nail problem will not benefit from the laser procedure, we will tell you this and save you the money! At the same time, we will then recommend a different treatment to resolve your nail problem. At the initial consultation we will examine you and if there is any question as to whether your nail problem is fungal or not, we will take a painless biopsy of the nail in order to confirm that your problem is in fact nail fungus. The laser procedure will not work if your problem is not fungus. If we think your problem is fungal, we will then perform the laser procedure right away in our office. If we are not sure if your problem is fungal, then you will require the painless nail biopsy and you will not be able to have the laser procedure on your initial visit. You will have to wait for the biopsy result to come back. This usually takes one to two weeks. If the biopsy comes back negative, we will then recommend different treatment options. If the biopsy comes back positive, we will then schedule your return visit for your laser procedure. Believe it or not, many other problems look like nail fungus, but are not fungus. If you do not have nail fungus, the laser will not work, and you will have wasted your money. As ethical physicians, we are very honest and want you to be happy with your laser treatment. We will always sacrifice the money we make on the laser treatment if we feel the laser will not help you. Right before your laser procedure we will take photographs of your nails. Then, we will use our highly specialized, cooling spray nail grinder to reduce the thickness of the nail as much as possible if necessary. (This is usually painless). We have found that grinding the nail thin with our special cooling spray grinder significantly increases the laser penetration, and the success rate, of the laser procedure. 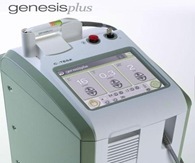 The laser procedure is performed right in our office with our latest technology laser. After evaluation and grinding, the procedure takes 20 – 30 minutes depending on how many nails are infected and how severe your problem is. It requires no anesthesia, and usually exhibits very little pain or heat. Most people report that they feel the heat generated by the laser, and minor pain at times. Many people travel from great distances for the laser nail procedure. For these people we will occasionally skip the nail biopsy procedure and perform the laser even if we are not sure if your problem is fungal or not. This saves you the long traveling time. If we perform the laser and your problem was not fungal, there is no harm done but the problem will not be solved. However, if we are sure that it is not fungal, we will not perform the procedure and will make other suggestions for your treatment. The only thing lost is your travel time. As stated above, when we are unsure if your problem is fungus or not, and we postpone the laser treatment in order to wait for the results of your biopsy, we will charge you for an initial consultation. The initial consultation will usually be covered by your health insurance. If it is not covered ,or you do not have health insurance that we accept, or you do not have any health insurance, the charge for the consult will be $50. This $50 will be applied towards your laser procedure. If we do your initial consultation and decide that you are not a candidate for the laser procedure, your total charge will be just the $50 for the consultation, and we will have saved you money by not doing a laser procedure that would not have worked. As a courtesy to our laser clients, this $50 is discounted from our usual consultation rates. This charge will cover our time, and also, you will receive alternative treatment options for your nail problem. Again, if you are a candidate for the laser, and we go forward with the laser, this $50 will be applied to the cost of the laser ($550 additional due on the day of the laser). The laboratory and pathologist that look at your biopsy will charge your health insurance as well. When the laboratory is not covered or if you do not have insurance, the charge for the laboratory will be an additional $50 over our consultation charge. This $50 is discounted from the laboratory usual charges. This laser procedure for nail fungus is currently not covered by any insurance. You may however, usually use your flexible spending or medical savings account. If you plan on using one of these accounts, we recommend that you check with your plan adviser to confirm, prior to your procedure. Additionally, we always recommend using a topical medicine daily after the laser. We have found this significantly increases the chances of success. We stock and sell this medicine in our office for $49. This topical medicine is safe and effective without systemic absorption and no side effects. it is usually applied at bedtime. If you cancel in advance of the laser you will not be charged for the procedure. If you have the initial consultation and opt not to perform the laser for any reason, your $50 consultation fee will not be refunded. If we determine that you are not a candidate for the laser, your initial consultation fee will not be refunded. Laboratory fees are not refundable as well. We are here to help you and we care about our patients! We are a group of young, ethical and friendly physicians. We are always out for the best interest of our patients and give truly altruistic care. Our practice philosophy is that by providing altruistic care with happy clients, our practice will grow. Feel free to call our office at any time or email us. We offer the best laser technology currently on the the market. The Cutera Laser for Nail Fungus. At 80 Watts of power this new laser is 20 times stronger than previous generation lasers for nail fungus which were rated at only 4 Watts. The Cutera Laser is a safe and effective treatment for nail fungus. It penetrates inside the nail where the nail fungus (dermatophytes) reside, killing the fungus instantly. The laser light passes right through the tough nail plate killing the fungus with minimal pain and no damage to the surrounding tissues. The laser procedure is done right in our office. Procedures usually take 20-30 minutes. They do NOT require any form of anesthesia and have minimal pain. Most patients will feel just some heat generated by the laser. No pain medication is required after the procedure and you can go right back to work or any activity immediately after treatment. In order to increase effectiveness, for one price, we offer three laser treatments for nail fungus. The second treatment is performed two months after the first, and the next treatment is performed two months later. You will not see results right away. The laser will not change your existing nails. As the new nail grows in, it shows signs of clearing from the bottom of the nail as it grows. This usually takes 6-12 months depending on how fast individual’s nails grow. In order to increase the chances of success, we combine our laser nail fungus treatment with the use of the best anti-fungal topical medication which is available for sale in our office. The use of topical anti-fungal medications also helps to prevent recurrence of the fungal infection. Often, we use our specialized cooling spray nail grinder to reduce any thick nail tissue in order to increase penetration of the laser. This is usually a painless procedure.